Lions and tigers and Boomer Balls! Boston-based international animal protection organization, FOUR PAWS International sends giant-sized toys to lions and tigers in South African sanctuary. International animal protection organization, FOUR PAWS International, has recently added a new component to their Big Cat Sanctuary, LIONSROCK in South Africa– Boomer Balls! 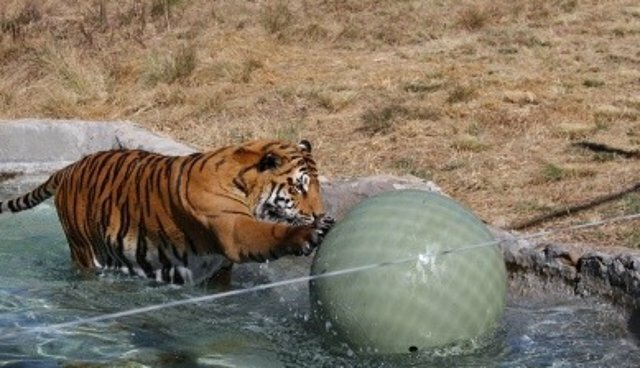 Boomer Balls are manufactured exclusively in the USA in Grayslake, Ohio, as indestructible, and quite sizeable toys that provide excitement and enrichment to wild animals in captivity. FOUR PAWS International USA Executive Director, Wim DeKok arranged the shipment of 10 Boomer Balls, and six weeks later, they arrived at the South African sanctuary. Within minutes, the balls elicited curiosity from the big cats. Hildegard Pirker, Head of Animal Welfare at LIONSROCK: "The animals were intrigued with the Boomer Balls as soon as they saw them. They began to paw at them, and play with them, and they were especially excited when the Boomer Balls rolled into the water!" DeKok: "The Boomer Balls from the USA will be a joy for the animals for years to come. We are just glad that we could help out our colleagues and the animals in South Africa this way". FOUR PAWS International is an international animal protection organization that works to protect animals through sustainable campaigns and projects. Its offices are in 11 countries, including its USA office in Boston, MA. FOUR PAWS International developed LIONSROCK Sanctuary in 2008, in South Africa. Since its inception, LIONSROCK has rescued more than 100 big cats -- lions, tigers, leopards, and cheetahs -- from all over the world. These animals, who were once subjected to inhumane treatment and poor living conditions, are now living, fittingly, in a habitat that is more appropriate for their species, sizeable enough for solitary animals and family groups, facilitates their natural behavior, and offers the highest standards of safety for people and animals. For more information on FOUR PAWS International, and LIONSROCK, go to www.four-paws.us.